Valentine's Day is tomorrow! Can you believe how quickly this year is flying by? 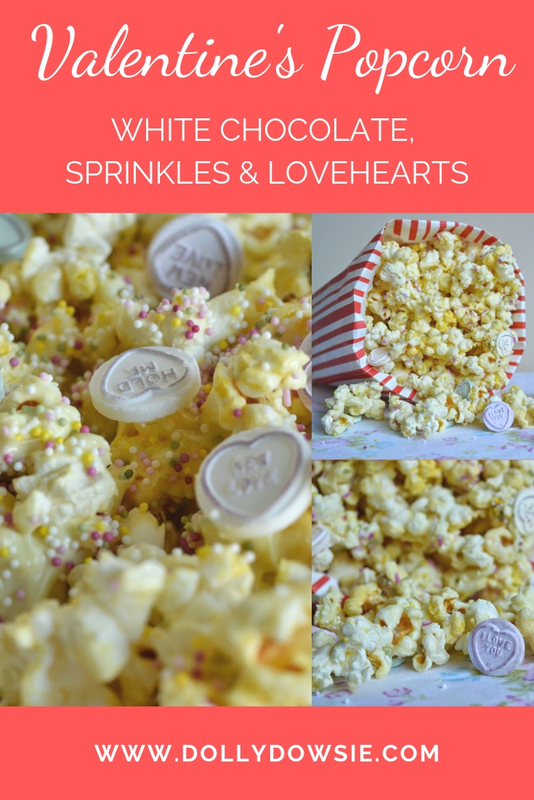 I've been preparing some tasty treats on the days leading up to the day of love, which I'm sure you've seen on the blog this past few days and this super sweet treat is probably my favourite by far - Valentine's Popcorn with white chocolate, lots of sprinkles and a scatter of Love Heart sweets. This is the perfect, simple and quick treat to prepare if you're having a quiet night in with your other half or if you're a single Sally who simply wants something yummy to munch on when watching a film by yourself or with the girls. Sprinkles, chocolate and sweets - what's not to love about this Valentine's popcorn? I had never thought about combining popcorn and chocolate together before - I have no idea why because I love having popcorn straight away M&Ms when I go to the cinema - the combination of chocolate and popcorn is one of the best there is. I used a mix of salty and butter microwave popcorn - the simpler the better for me when it comes to making sweet things for my boys and I to enjoy. I melted the white chocolate (I used two big bars) in a bowl above a saucepan. I then mixed the melted chocolate with the popcorn and spread out evenly on a tray lined with baking parchment. When the chocolate was still wet I sprinkled hundreds and thousands all over the popcorn and then dotted Love Hearts around where there was most chocolate for it to stick too. Then I placed it in the fridge for ten minutes and... it was done! How super simple is that?! I'm going to make some more of this popcorn for my sons birthday on Monday. It can be adapted for any occasion and you can mix it up with different coloured sprinkles and sweets. I think it's such a fun treat and oh my God is it tasty! Seriously, someone take the popcorn box off me... speaking of which, isn't my retro style popcorn box so cool?! I picked it up in a local discount store for just €1.50 - such a bargain! I also picked up the retro style popcorn bags too, I think they're great for parties and would look great on display on a food display, like those amazing ones I always see on Pinterest. You can see my Valentine's Cupcakes and Gold & Pink Glittered Cupcakes here if you're in need of some more Valentines sweet treat inspiration. That is a lethal combo in my house.. we can eat tons of candy and popcorn in a sitting..
Wow, I love this idea and my fave snack food. Yum I love popcorn, so do my kids. This would be a really fun movie night treat! And different. Sounds great! This is so cute! I love the way the sprinkles look on the popcorn! This would be a great treat for birthdays too! This looks so good. Can;t wait to try and make it! You have made an every day treat into a super festive Valentine's snack! You are amazingly creative. This looks like a great Valentines Day treat. I will have to make some up for the kids. Mmmh, this looks delicious! I really like the idea of the sprinkles. Who doesn't love sweet and salty! This looks sinful. I couldn't share this, it would be mine alone. What a fun way to use the conversation hearts. I think this whole treat sounds tasty good. That looks so tempting! I haven't tried popcorn with white chocolate before but now I definitely want to! Great pictures and cute idea. I love popcorn and never thought of adding candy to it. What a cute idea, my girls would love this! What a very unique popcorn you have here - too awesome! Perfect for the LOVE DAY! This is looks like a really great snack idea. Something for everyone in one snack. We always add candy to our popcorn! But I've never tried it with this kind of candy. I usually add M&Ms or Reeses! What a great idea for Valentine's Day. That looks so good too. You make the coolest stuff! I love this popcorn. It turns an ordinary snack into something really special. It looks like the perfect and most satisfying snack. I love treats that combine sweet and savory flavors. What a great idea! I love anything you can make from the heart. Sweet and salty is a great pair! I love this idea of adding candy hearts to popcorn. This is a "must do" for next year! Oh my god, this looks so good- great idea!